There has never been an age…in which the love of landscape has not in some way been manifested.... [Man’s] nature is congenial with the elements of the planet itself, and he cannot but sympathize with its features, its various aspects, and its phenomena in all situations. Wivenhoe Park, Essex radiates clarity. It is easy to imagine oneself on this quiet summer afternoon, under the shady tree just out of sight of the painting’s foreground, where the painter may have set up his easel. All is placid and in place—contented cows graze or snooze, fishermen drag their nets in the pond, and a kitchen garden and domestic animals occupy the space beyond the trees on the right—features typical of the self-sustaining nature of such a country estate. Moving up the slope in the far left distance is Mary Rebow, daughter of the estate’s owner, Major-General Francis Slater Rebow, driving a donkey cart with a friend, having just crossed the stone dam from the main house perched at the top center of the canvas and bathed in sunlight. The pattern of puffy clouds in the sky is the most active aspect of the picture, the weather producing an occasional breeze to set the flock of birds into flight and rustling the leaves of trees dotting the scene. 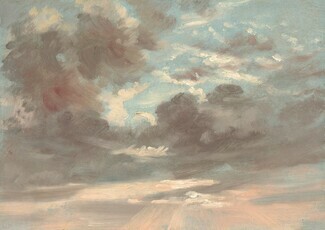 Constable believed that it was through depictions of light and sky that the painter expressed emotions, capturing what he termed the “chiaroscuro of nature,” evanescent effects of light and dark experienced outdoors. Later in the century, the impressionist painters were to take up this goal as well. John Constable, Fishing with a Net on Lake Wivenhoe Park, 1888. V&A Images/Victoria and Albert Museum. Wivenhoe Park, located about 55 miles northeast of London, was the seat of the Rebow family. Major-General Rebow, a friend of Constable’s father, commissioned the artist to capture the beauty of his estate, inviting him to spend some weeks on the premises. General Rebow specified that certain features be included in the painting. 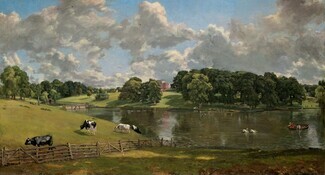 Constable arranged these harmoniously, modifying the actual location of certain elements (for example, the house and lake were not actually part of the same view). Typically, the owner of such a house might wish for a more grandiose portrait of it, but Constable preferred the everyday poetry of landscape and sky. The painting was a important project for Constable on a personal level: He needed the income the commission generated in order to provide for his longtime love, Maria Bicknell, and enable them to marry with the approval of her parents, who opposed the match for a number of years. Wivenhoe Park, Essex was finished by September 1816, and Bicknell and Constable were at last married on October 2, 1816. John Constable, Self-Portrait, 1806. Tate, London / Art Resource, NY. 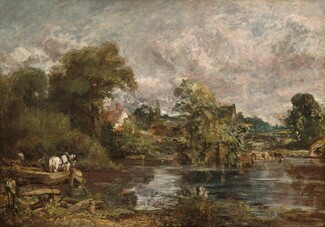 John Constable did not come from a family of artists; rather, his interest grew gradually under the tutelage of local painters and connoisseurs he befriended. His father was a flour miller in East Bergholt, Suffolk, a profession he expected his son to assume. John joined the family business after completing school, but in 1799, around age 23, was able to convince his skeptical father to allow him to pursue artistic training. Supported by an allowance, he enrolled at London’s Royal Academy of Art, the foremost institution for arts education and for exhibition of work by accomplished artists. Constable studied the naturalistic landscapes of 17th-century Dutch artists and the classically infused ones by French artist Claude Lorrain. His initial efforts were not met with great acclaim, and he struggled for a decade, taking up more lucrative portrait painting commissions to augment the allowance from his family. Nonetheless, Constable remained focused on scenes of a domesticated landscape imbued with “human associations” rather than the dramatic vistas or sentimental or narrative scenes in favor with the Academy. 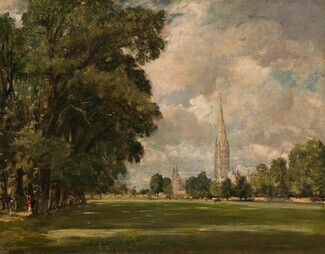 Ambitious and determined, he honed his craft in the countryside around his family’s home and in places such as Salisbury in the southwest, where he stayed with a friend and frequently painted its cathedral (an example of which is also in the collection). John Constable, Maria Constable with two of her Children, c. 1820. Tate, London / Art Resource, NY. By 1816, Constable had achieved enough stability in his professional life to enable him to marry his longtime fiancée, Maria Bicknell, with whom he had seven children and a happy marriage. (Constable’s voluminous writings have left an extensive account of all the details of his life.) Initially the family lived in London and then Hampstead, a small village outside the city. An artistic breakthrough occurred around 1820, when Constable was well into his 40s, with several six-foot wide pictures that he painted with the express purpose of garnering the approval of the academy—accustomed to monumental pictures—without sacrificing his own aims. The works started receiving notice in the press, and he was elected an associate academician around this time, which conferred hanging privileges in exhibitions. He finally achieved the rank of full academician at the Royal Academy in 1829, at age 54, recognized as one of the best landscape painters of his age. But the success was bittersweet for Constable, who had lost his beloved Maria the previous year and never fully recovered from the loss. An illness in 1833 crippled the use of his right hand, and he began making drawings and watercolors, which were less physically demanding. He died in 1837 at 60. The first major exhibition devoted to Constable’s work took place in 1899; by then he had become a hero to numerous landscape artists of intervening generations and was directly responsible for elevating the status of the landscape genre in the 19th century.